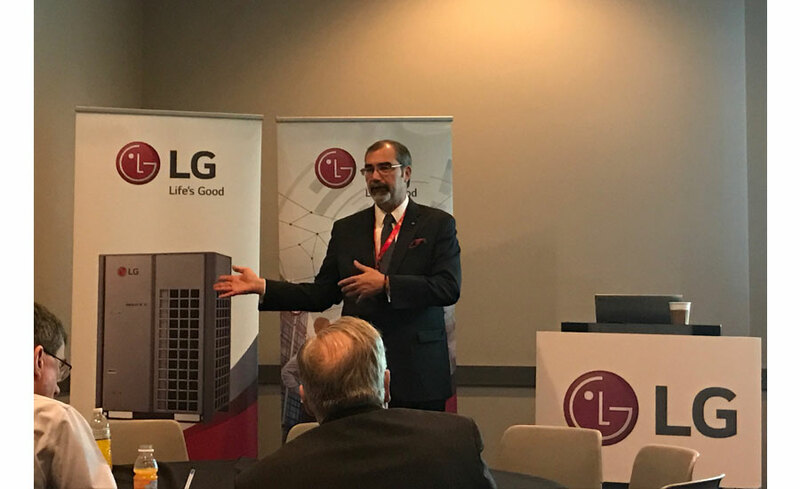 LAS VEGAS – LG Electronics hosted a press conference during the 2017 AHR Expo to reveal its expanded 2017 lineup of commercial and residential HVAC solutions with a new customizable control system, next-generation variable refrigerant flow (VRF) technology, new heating capabilities, and design tools. Kevin McNamara, senior vice president, Air Conditioning Technologies, LG Electronics USA highlighted several new products being featured at the AHR Expo, including the LG Multi V™ 5, LG Multi V S, LG RED° Heat Powerful Heating Technology optimized for cold climate performance, the Smart ThinQ® application, and the Lg MultiSITE Controls suite. The expanded control solutions include the LG MultiSITE Remote Controller, LG MultiSITE Communications Manager and LG MultiSITE VM3 Building Management Solution empower operators to take control of their buildings in ways that were not previously possible. What if I told you that websites and smartphones had hamburgers in them? You would probably think that I have totally lost it after coming off my meds. But it’s absolutely true, I kid you not. When you open an app on your smartphone or some websites today, you could be looking at a hamburger — a hamburger menu icon, that is. The hamburger menu (which doesn’t come with a side order of fries) is the three horizontal lines you see now at the top of many screens, either on the far left or the far right. By touching, tapping or clicking on the icon, it opens up a side menu with a selection of options or additional pages. Some developers love the hamburger 3 line menu icon because it enables them to pack more features into their apps or navigation. The tiny icon takes up a minimal amount of screen real estate. It gives the app or site a clean minimalist look. It is easy enough for the app user or website visitor to press the button to slide the menu in and out. However, other developers and some users absolutely detest the hamburger menu icon or simply are puzzled by it. Why? Because it isn’t obvious to all users that the three lines actually are a menu icon, and it doesn’t tell users what is in there. Who “Invented” The Hamburger Menu Icon? The inventor behind the hamburger menu icon is a man named Norm Cox. He made the burger icon for Xerox Star, which was the world’s first graphical user interface. That was more than three decades ago. Afterwards though, the icon did a disappearing act. It’s only relatively recently that the 3 line menu icon started creeping back, with the advent of mobile devices. For instance, in 2008 it showed up in the Twitter app, Tweetie. Then in 2009 it showed up in the Voice Memos app for the iPhone 3GS. “I have to chuckle at all the attention that little “hamburger” symbol is getting lately,” Cox said in an interview with Small Business Trends. Cox said the three line hamburger image turned out to be just right. “This symbol was visually simple, easily explained, and functionally memorable. Three lines were the perfect number,” Cox added. What Websites or Apps Use This Infamous Hamburger Menu Icon? Some of the prominent names that use the hamburger icon in their apps include Gmail, Facebook, Reeder, Twitter, and Starbucks. And now websites and browsers have also adopted the 3 line menu icon. The Chrome and Firefox browsers are an example of this, using the menu at the top right corner. The hamburger menu hides all of the options, settings, and extensions. And the icon glows orange when something in the browser needs to be fixed or updated. 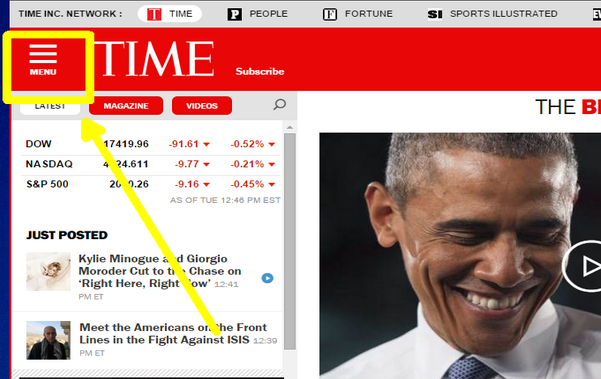 Time.com is an example of a major website that uses the hamburger menu — in this case in the upper left corner. When you click on the 3 line menu icon, a slide out showing additional content links appears. Some experts point out that the functions in the hamburger menu are barely used. First of all, many people have yet to figure out that the 3 horizontal lines are actually a menu icon, and not simply an image. Second, the hamburger icon makes information in the hidden menu “out of sight, out of mind.” Unless they actually click on or touch the 3 line menu icon, they don’t see the choices there. Indeed, in Time.com’s case, the word “menu” had to be added underneath the icon to make it more obvious what the symbol is. Various developers have voiced their displeasure at the hamburger icon and its shortcomings. Some refuse to use the icon, despite its trendiness. But the most high-profile company which has made a change is Facebook. To be absolutely clear, Facebook has never publicly stated that it wants to totally get rid of it. But Facebook is bringing out some of the mobile features that were previously hidden behind the hamburger icon. They are now displayed in a horizontal bar at the bottom of the screen, called a tab bar. The bottom tab bar takes up a bit more real estate on the screen, but it makes certain functions more obvious. We spoke with Mrinal Desai who is the CEO and Co-Founder of Addappt. He was also behind Crossloop, a crowdsourced remote tech app, which was eventually sold to AVG Anti-Virus. “These decisions often depend on the goal of the app. The hamburger icon tends to relegate functions whereas the tab bar makes them more obvious,” added Desai. 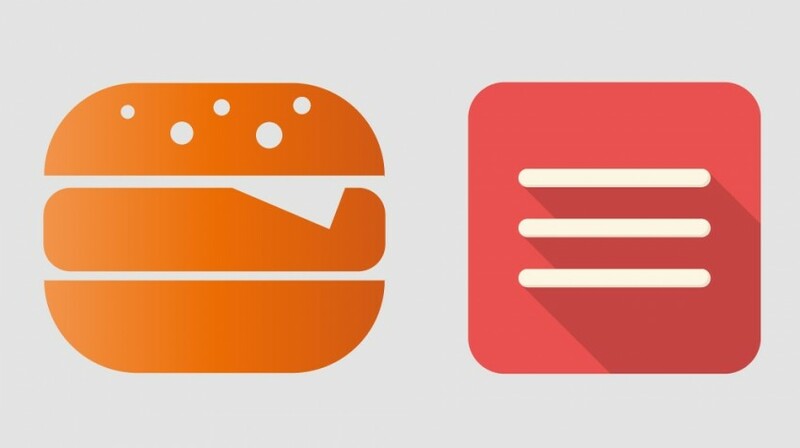 So should you use a hamburger menu icon in your own website, mobile theme or app? The original developer of the icon should get the last word, we think. “The symbol’s longevity (since the 1980s) is a testament to its simplicity, utility, learnability and memorability,” said Cox, when asked about the calls to kill the hamburger icon. Smartphones are key communication tools in the personal and work life of the connected world we now live in. And with every new phone entering the marketplace, more features are added that increase our reliance on these devices. 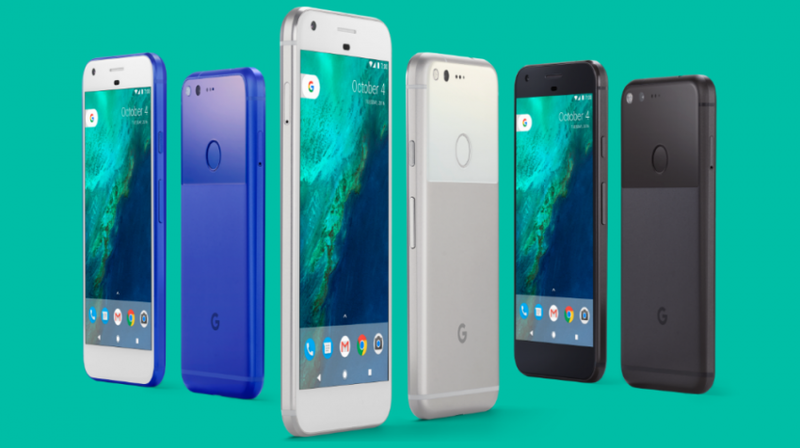 The long-awaited new Pixel and Pixel XL phones from Google (NASDAQ:GOOGL) come with some premium hardware and applications that will undoubtedly increase this reliance for Android users looking for a premium device. For small business owners full-featured premium smartphones are not always an option, mainly because of the price. The new phones from Google are made to compete with flagship phones from Apple, Samsung and others, and they are priced accordingly. While the Pixel phones may price many customers out, businesses and otherwise, the features in the phones make a strong case for the price tag. Here are some of the specs for both phones, which are very similar, giving you the option of having a powerful smartphone in a large and small form factor. 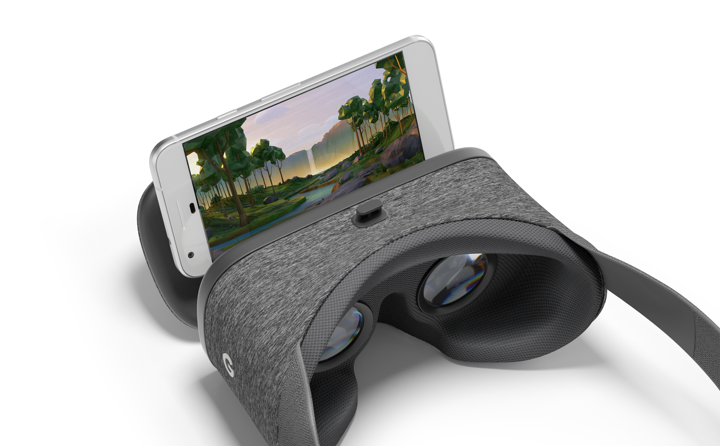 Built for VR: You can get the new Daydream View VR headset for free if you pre-order. The phones also share the same sensors, which includes a fingerprint sensor, Android 7.1 Nougat, and skins with new colors the company calls Quite Black, Very Silver, and Really Blue. The differences are very few, and it is mostly based on the size of the phones. Form Factor: 6.0 x 2.9 x 0.2 ~ 0.34 inches or 154.7 x 75.7 x 7.3 ~ 8.5 mm. Form Factor: 5.6 x 2.7 x 0.2 ~ 0.3 inches or 143.8 x 69.5 x 7.3 ~ 8.5 mm. While you can find these features on many phones, there are some ways in which the Pixel phones differentiate themselves. They are the first phones to have built-in Google Assistant and a live 24×7 customer care support with integrated Screen Share. And you get unlimited cloud storage, a feature most, if not all, phone manufacturers charge for. What Will Pixel Phones Offer Small Business Owners? Unlimited storage is a great option, because virtually every small business with an online presence can use it to store video, audio, and data they capture on their phone without any worries. Google Assistant uses the latest technology in AI to deliver a more intuitive experience to get answers, manage everyday tasks, be entertained, find photos faster, keep tabs on travel and much more. The AI also integrates Now on Tap, which will give you contextual information based on what is on your screen. 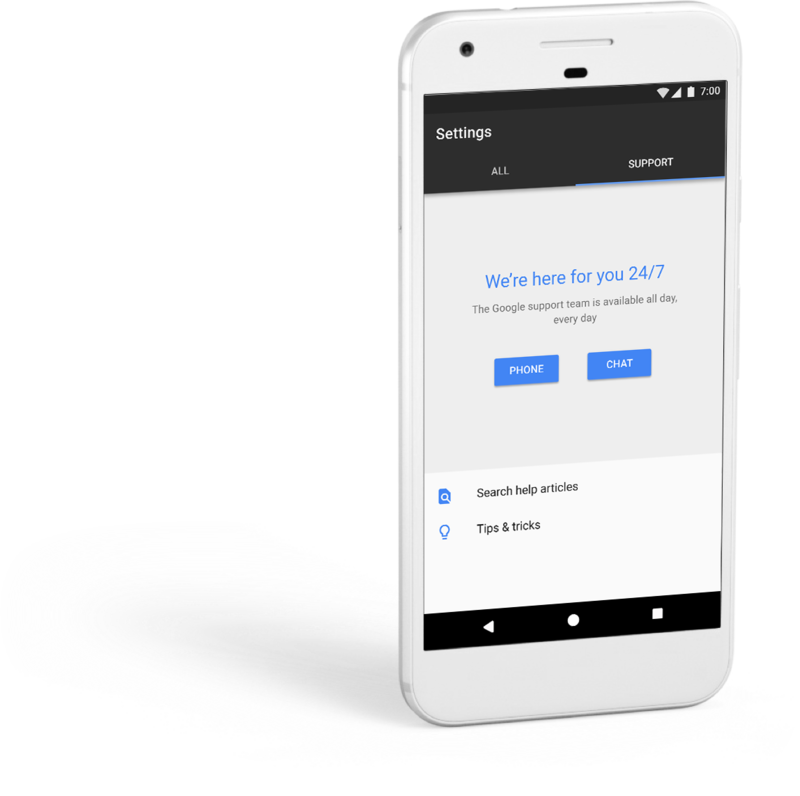 If you happen to own an iPhone, a new fast switch feature lets you quickly migrate to Pixel in three simple steps and a long battery life that will come in handy for any small business owner. Last but definitely not least is the 24/7 customer care support with integrated Screen Share. As any small business owner knows, customer service will make or break your business, and this feature is a winner. Being able to access care support with integrated Screen Share means you will never be at a loss of what to do when something goes wrong. According to the company, no matter where you are, day or night a Google expert is just a tap away. All you have to do is open the Settings app on your device and tap the Support tab and simply accept the “View screen share request” sent by the agent. The smartphone segment is heavily populated, and the trend seems to be going to medium priced phones with high end features, which is currently being dominated by Chinese manufacturers like ZTE and its Axon7, Huawei and others. This doesn’t seem to have factored in for Google, because the Pixel line is not cheap, as a matter of fact they are expensive. The Pixel with the 32GB storage starts at $649 and the 128GB model will cost you a wallet crunching $749. If you want the XL, you will have to pay $769 and $869 respectively for the 32GB and 128GB models. You can pre-order the phones now, and they will be arriving at retail and online stores by October 20. The Pixel phones will not win the most innovative design, specs or app awards, but the sum of all its different parts would seem to suggest a useful phone for the small business owner — that is if you want to part with what it will cost to get it.